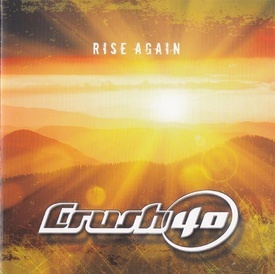 Rise Again is the first EP from the Sega-centric band Crush 40. It is also their first release to be comprised entirely of new material not written for any specific video game. Even so, the first track on the extended play, "Sonic Youth," is a love letter to the Sonic franchise, referencing most every song the band has performed over the previous 14 years. An early version of the EP was released at Summer of Sonic 2012, with different artwork and only three tracks. All four tracks were made available on iTunes as singles for US$0.99, £0.79, 0.99€ or ¥150. "Song of Hope" was first released on 30 November 2011 as a charity single on iTunes for the victims of the 2011 tsunami. My family for always understanding when I need to go into the studio and not to the beach! 14 years of Crushing...and more to come. I thank YOU...you guys are simply the best.